There is only one thing wrong with making a Christmas ornament tutorial in September - my privet hedge had to stand in for a real Christmas tree! 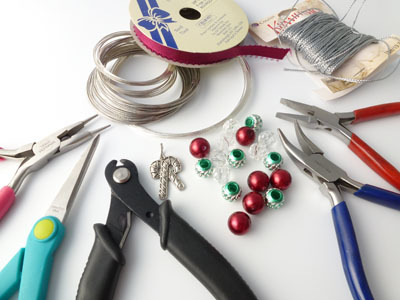 But seriously, get into organizational mode and make these easy peasy bead and ribbon wreath ornaments for those on your gift list. They are inspired by a popular necklace and bracelet style usually with pearls and ribbon or lace. The Tis the Season beads and charms and silver kumihimo thread (used in last month's assignment) were courtesy of Prima Bead. I recommend using memory wire as it will hold its shape well especially when working with it. 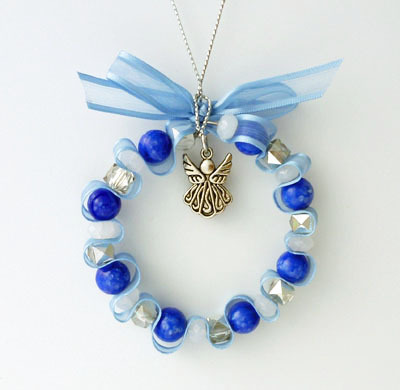 You can make these any size you like - I used the larger bracelet size. 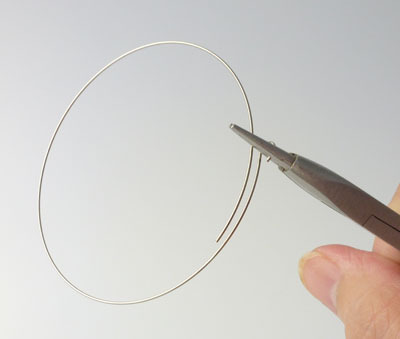 Cut one round of memory wire with about 1 inch overlap - this is a little more than you need. I really like using proper memory wire cutters - they seem to work better than large manly wire cutters. 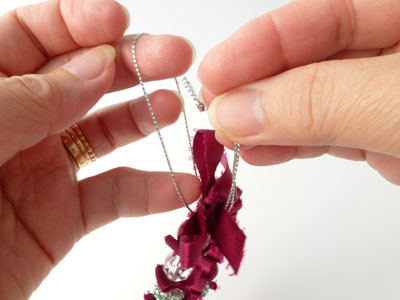 Make a loop at one end so beads don't fall out ! Leave a ribbon tail of about 6 inches. 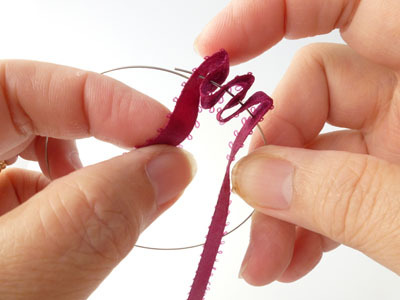 Then poke the open wire end through loops of ribbon to create 3 loops on the outside edge. String on a bead. 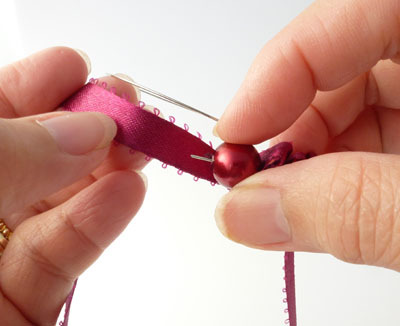 Keep the exposed wire end short when piercing so the ribbon just "wraps" the bead. 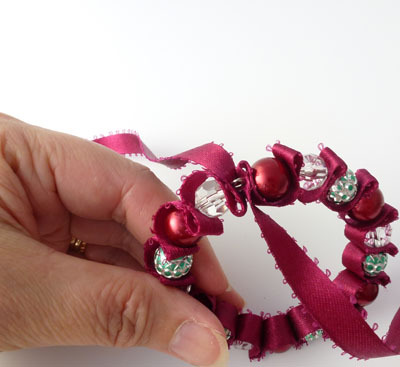 Include 3 folds of ribbon in between each bead. When you get to the end, trim off about 1/2 inch and make loop. Hook on to the other loop. Make sure both loops are closed properly. The ribbon ends should be leading off in opposite directions. One end can wrap around the wire loops and a neat bow can be tied. 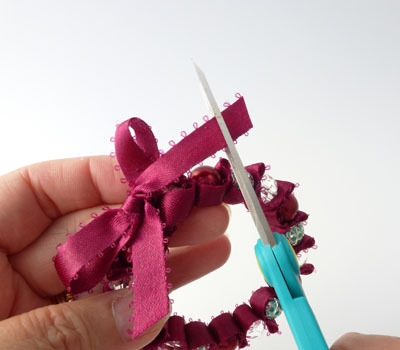 Trim the ribbon. 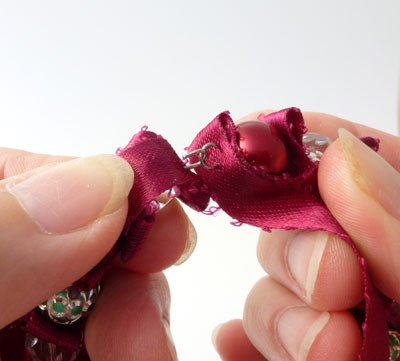 Use Fray Check or glue to seal the edges of the ribbon. 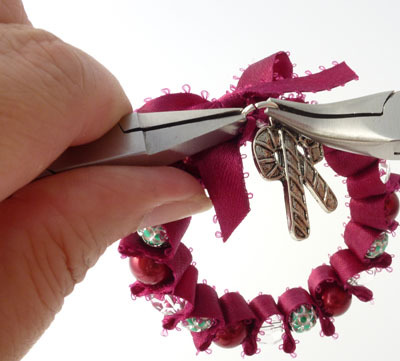 Attach the charm bearing jump ring to somewhere on the top of the wreath. Cut a length of hanging cord, double it and make a knot at the ends. Use this loop to hang the ornament. Weaving the ribbon alternatively around each bead as with the blue wreath is yet another design idea. Check out what my fellow Prima team mates did on their blogs. Our collective designs are also pinned on the Prima Bead Bloggers Pinterest board. These wreaths are so pretty! I love the use of ribbon in them. So pretty and fun and a great clear tutorial too! These are great Pearl! I am going to have to make some for quick gifts. I love ribbon ornaments - yours are especially pretty! I want to make these, what size beads will I need? You can use any size beads you want! Try 8 or 20 mm beads and see if you like them, have fun!